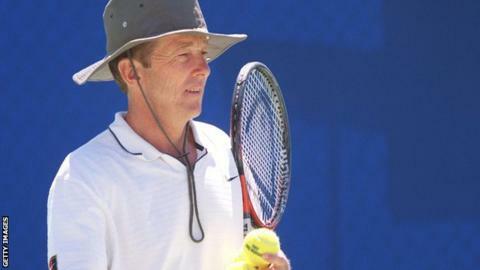 Bob Brett has resigned as director of player development at the Lawn Tennis Association (LTA) and will leave the post this week. The Australian was appointed in June 2014 to help develop Britain's coaches and players. "I have enjoyed my time at the LTA," said Brett, who previously coached Boris Becker during his 35-year career. LTA chief executive Michael Downey will take over for an interim period until a new performance director is found. The LTA say the search for a replacement "is progressing well". Downey said: "Despite a relatively short tenure at the LTA, Bob has made a difference in improving our nation's chances for greater success." Brett also previously coached Grand Slam champions Goran Ivanisevic and Marin Cilic. "Bob Brett lasted less than 11 months in the job, but in that time he has successfully remodelled training camps for aspiring British juniors and made a lasting impression on some of our best coaches. "His resignation comes as no surprise: he was put in an invidious position when the LTA confirmed in May they would be employing a performance director to fulfil part of the role Brett had been brought in to do. "His strengths lie in working on court with players, and it was always unrealistic to expect him to play a significant part in managing the performance programme as well."